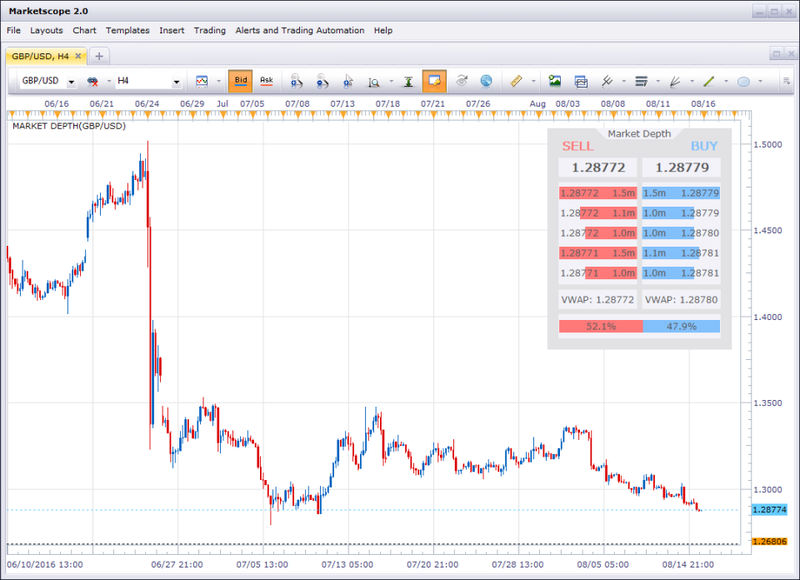 Market Depth requires a live, funded FXCM Active Trader account on a discounted pricing model. Questions? To learn more about ATG accounts, please contact us. Available to our high-volume traders, the Market Depth indicator tells you how much liquidity is available at a given price. With SSI, you know where other traders are in the market. The Market Depth indicator goes one step further and gives you an insight into the sentiment of the liquidity providers. Your platform already shows you the best available price from our liquidity providers. 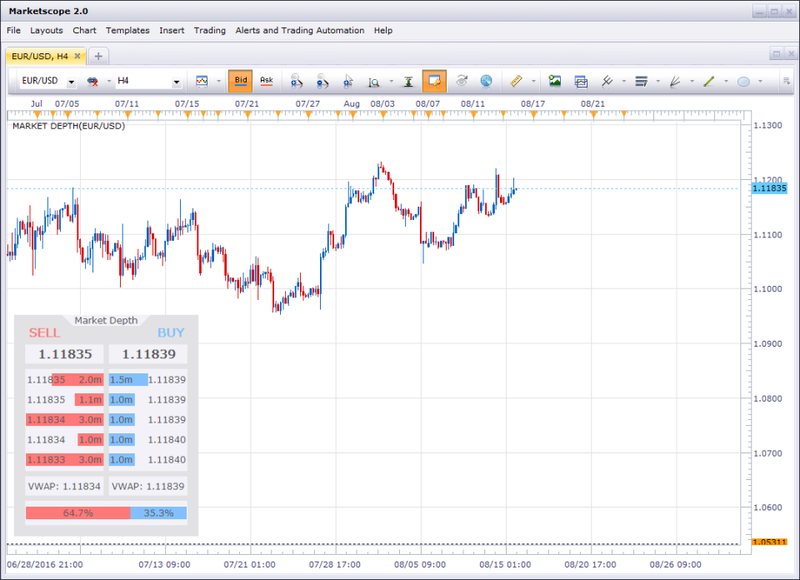 Now, Market Depth allows you to see five levels deep on 18 of the world’s most-traded currency pairs. Along with showing the volume-weighted average price (VWAP), the indicator’s total percentage bar can help give you an indication of possible market direction. Day traders and scalpers will find this indicator a great addition to their technical analysis. 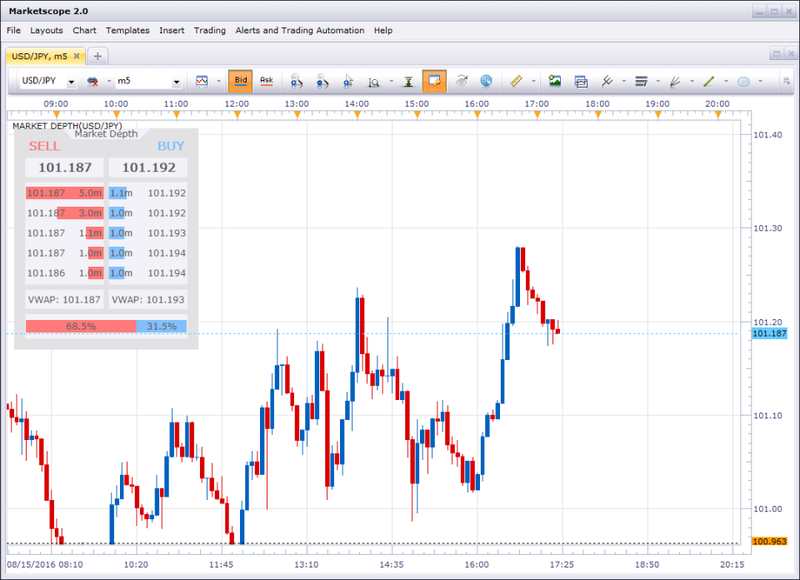 The Market Depth indicator is compatible with 18 symbols: NZD/USD, AUD/JPY, USD/JPY, GBP/NZD, EUR/USD, EUR/AUD, GBP/USD, GBP/CAD, USD/CAD, EUR/JPY, EUR/GBP, GBP/JPY, GBP/AUD, USD/CHF, AUD/USD, AUD/CAD, EUR/NZD and XAU/USD. A live, funded FXCM Active Trader Group (ATG) account (learn more) on a discounted pricing model is required.To learn more about ATG accounts, please contact us. This app does not work with practice/demo accounts. Microsoft Visual C++ (Free download).